NEET is beautiful, because NEET is neat! Currently, NEET is denounced for being unproductive and unmarketable by the market of capitalism. 3-D world is too harsh on us. Real girls call me a bum for staying home to watch anime. Though it’s the only NEET thing to do! That’s why we’re agoraphobic (fear of market), they call us “slackers, the dregs of society,” so we become hikky. Yet, this anime is about NEET, especially a new-type of NEET called “neo-NEET.” Yes, a super-NEET that has found a way to live independently. Basically NEET is a person with no job, no income. Neo-NEET is with no job, but neat income, which is unearned income. Income without employment, yes, income without labor! And Alice is the prototype of neo-NEET! 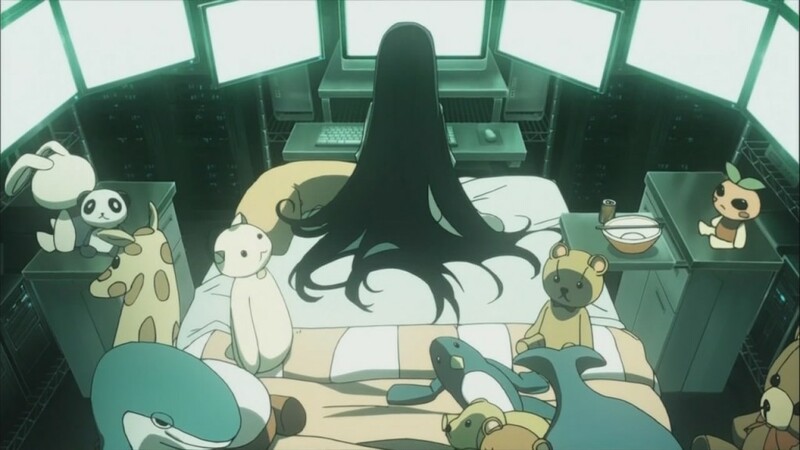 Alice calls herself “a NEET detective” in her situation room, but basically she’s an IAD hikikomori, surrounded by LCD monitors, somewhere in Shibuya, the shady town of hip youth in Tokyo, with the Hachikou statue, also TWEWY‘s town, which has been looking down upon Akiba-kei as inferior creatures. As a neo-NEET, Alice’s mission is to write words of dead folks victimized by 3-D, i.e., capitalist society. Yes, victims who didn’t have any means to tell the truth to the world. She thinks that a detective is a speaker for the dead, which I guess she got the idea from Speaker For The Dead by Orson Scott Card. Yes, she is someway like miko (female shaman). Yes, Alice the miko! And she calls the dead’s information “Kamisama No Memo-chō (God’s notebook).” Yes, dead people are seen gods in Shinto. So, she serves them like an automatic writer. Alice reminds me of Chifuyu-chan, a 14 years old hikky girl practicing futoukou (不登校 “school refusal“) since 3rd grade, who has become a huge sensation over 2chan after appearing on NHK program. Her skin is pale like Alice since she doesn’t go out under the sun, a sign of non-productivity, typical of NEET. Yes, Edelweiss (noble white), which can be interpreted as “noble pale skin.” So, Edelweiss is about NEET. Alice (Adalheidis) is Edelweiss! Non-productivity is what bhiku (buddhist monk, literally “beggar”) practices since they try to be Arya-puggala. So, they refuse work. In Ancient Greece, citizens didn’t work because it was their privilege not to engage in labor. Only slaves did. We now have democracy which is supposed to have made us all noble. Our fundamental rights such as right to vote and run for office were once privileges of the noble class. But democracy hasn’t made us all privileged. We’re still slaves since we aren’t freed from Sisyphus’ punishment. So we’ve made a step to make us noble by refusing to work. Yes, we’ve become NEET. Yes, not only school refusal, but also work refusal. Labor refusal! Yes, the right to be lazy, the ultimate nobility. So, NEET is the real prince. NEET is the Alice. We’re the pioneer of real democracy. Tora-san was an analog NEET, so he was a pioneer for us the digital NEET! Girls have always dreamed about dating a prince, right? So, why don’t they go out with NEET then! That will make their childhood dream come true! Too bad 3-D girls don’t realize we are the real prince… Even if a million people think we’re losers, the providence has proven that we are Arya-puggala! We are all Alice! Le Petit Prince! 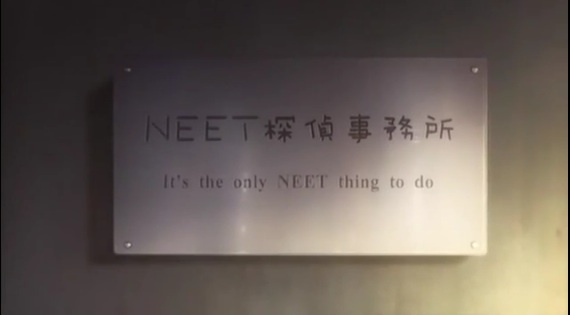 Thus, we’re proud to be NEET! Thank you for the compliment! Yes, that’s all I want in my life, praise and acceptance! wow. This was breathe taking.